Second grade is the year where the foundations built in pre-k, kindergarten and first grade come together. Students are able to apply the skills they have learned to the next level. 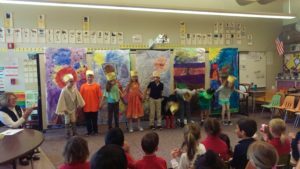 Our academic program emphasizes language arts, reading, writing, speaking, and thinking skills and is integrated into all areas of our curriculum. Our math program emphasizes rigorous thinking, computation, and problem-solving skills and experience-based learning. It is such an incredible year of growth and change for children academically, emotionally, and spiritually. 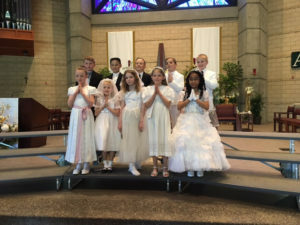 Religious lessons in second grade are important because students are preparing to receive the Sacrament of First Reconciliation. Each day in Catholic school presents opportunities for students to put their values to use in the classroom, at lunch, and at recess. Use parts of a book (table of contents, chapter titles, index, etc.) to locate information. Interpret information from charts, diagrams, and graphs. Read informational text to locate specific information. Be able to connect information found in the text to other known information or experiences. Retell the sequence of events in a story. Identify and describe the setting, plot, and characters in a story. Describe the cause and effect of specific events in a story. Use letter-sound correspondence knowledge to sound out unknown words. Read aloud grade-level text fluently and accurately with appropriate intonation and expression using cues of punctuation to assist. By the end of the second grade, read aloud unpracticed, grade-level text, at a target rate of 90-100 words correct per minute. Listen to, read, and understand a wide variety of grade-level informational and narrative text including children’s magazines and newspapers, dictionaries, other reference materials, online information, poetry, classic and contemporary literature. Demonstrate listening comprehension of more complex text through discussions. Draw upon a variety of comprehension strategies as needed. Reread sentences when meaning is not clear. Read voluntarily for interest and your own purposes. Understand, learn, and use new vocabulary. Determine meanings of words by using a dictionary or glossary. 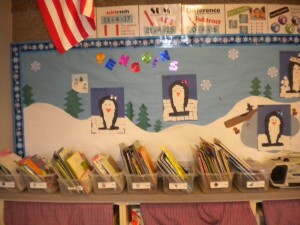 Read written directions, signs, captions, warning labels, and informational books. Use titles, tables of contents, and chapter headings to locate information in a text. Interpret information from diagrams, charts, and graphs. Read informational texts for answers to specific questions or for specific purposes. Recall facts and details in the text to clarify and organize ideas. Pose possible answers to how, why, and what-if questions. Connect the information in text to life experiences, text, and world. Connect and compare information across selections. Listen to and read a text to make connections and respond to significant works of children’s literature from a variety of cultures and time periods. Retell the sequence of the story. Identify and describe the plot, setting, and character(s) in the story. With guidance, make reasonable judgments about what to include in written compositions. Group related ideas to maintain a consistent focus. Develop an idea with an introductory sentence, supporting sentence(s), and a concluding sentence. Spell correctly words which are used frequently but do not fit common spelling patterns. Spell correctly words with short and long vowel sounds, r-controlled vowels, and consonant-blend patterns. Spell correctly previously studied words and spelling patterns in own writing. Represent all sounds in a word when spelling independently. Identify and correctly write various parts of speech, including nouns and verbs. Form letters correctly and space words and sentences properly so that printing can be read easily by another person. Plan, draft and revise an original piece of writing. Understand the purposes of various reference materials. Find ideas for writing in pictures and/or books. Tell experiences in logical order. With guidance, report on a topic with supportive facts and details. Speak clearly and at an appropriate pace for the type of communication (e.g., informal discussion, report to class). Determine the purpose of listening (e.g., to obtain information, to solve problems, for enjoyment). Ask for clarification and explanation of stories and ideas. Give and follow three-and four-step oral directions. Listen and retell stories of Jesus’ life in own words. Participate in frequent prayer experiences using a variety of formats( formal and spontaneous). Relate learning to real life experiences. Discuss and raise questions about doctrine. Respond creatively to lessons learned (e.g. role play, writing plays, etc.). Actively participate in liturgical/sacramental celebrations. Examine conscience in light of doctrine. Live out the concept of stewardship. Explain the meaning of major feasts in the Church. Demonstrate appropriate behavior and gestures for Mass. Know signs of the Sacraments of Baptism, Holy Eucharist, and Reconciliation. Know the name of the current Pope and Bishop. Express gratitude for the gift of God’s Son through prayer. Treat others with respect and love. Know the Pastor/Pastoral Ministers by name. Experience the faith community of the classroom/school/parish/community. Know and recite prayers appropriate to grade level. Pray spontaneously in own words. Write, compare, and order whole numbers to 1000. Understand and apply base-ten numeration, and count in multiples on one, two, five, ten, and one hundred. Compose and decompose whole numbers less than one thousand by place value (e.g., 426 as 4 hundreds + 2 tens + 6 ones and 400 + 20 + 6). Apply, with fluency, sums to 20 and related subtraction facts. Solve multi-digit whole number problems by applying various meanings (e.g. taking away, and comparing) and models (e.g., combining or separating sets, using number lines, and hundred charts) of addition and subtraction. Develop fluency with efficient procedures for adding and subtracting multi-digit whole numbers and understand why the procedures work on the basis of place value and number properties. Select and apply efficient methods to estimate sums and differences or calculate them mentally depending on the numbers and context involved. Determine the value of mixed collections of coins to $1.00. Determine length by finding the total number of equal-length units that are placed end-to-end without gaps or overlaps. Apply concepts of partitioning (the mental activity of slicing the length of an object into equal-sized units) and transitivity (e.g., if object A is longer than object B and object B is longer than object C, then object A is longer than object C). Demonstrate an understanding that using different measurement units will result in different numerical measurements for the same object. Use the measurement process: choose an appropriate measurement unit, compare that unit to the object, and report the number of units. Demonstrate an understanding of time and use of time relationships (e.g., how many minutes in an hour, days in a week, and months in a year). Tell time in increments of five minutes using analog and digital clocks. Compare and contrast characteristics and behaviors of plants and animals and the environments where they live. Compare and contrast how objects and materials respond to magnetic forces. Describe life cycles of living things. Observe and record the patterns of apparent movement of the sun and the moon. Record and summarize daily and seasonal temperature changes. Observe, measure, and record properties of objects and substances using simple tools to gather data and extend the senses. Make predictions about living and non-living things and events in the environment based on observed patterns. Make, describe, and compare observations, and organize recorded data. Use tools to construct a simply designed structure out of common objects and materials. Work with a team to complete a designed structure that can be shared with others. Describe an engineering design that is used to solve a problem or address a need. Describe how people’s actions have an effect on others / the environment. Understand that scientific developments help keep us healthy. Understand the importance of recycling and its impact on the environment. Identify and access resources for basic health and safety information. Demonstrate ways to avoid unsafe situations and practice healthy behaviors. Identify that alcohol and tobacco, including cigarettes, cigars, pipes, and smokeless tobacco are harmful to one’s health. Demonstrate refusal skills around the use of tobacco and alcohol products. Recognize the importance of variety and moderation in food selection and consumption. Identify essential ideas and values expressed in national symbols, heroes, and patriotic songs of the United States. Identify rights that people have in their communities. Identify ways that people can participate in their communities and the responsibilities of participation. Understand that limited resources make economic choices necessary. Identify ways of making money to buy the desired product and what it will cost in time and energy for each option. View and draw simple maps and pictures to locate, describe, and show movement among places. Identify major physical features and describe how they are represented on maps, globes, and other tools. Identify physical characteristics of places and compare them. Understand calendar time sequences and chronological sequences within narratives. Understand events from local history. Identify an issue or problem that can be studied. Gather information relating to an issue or problem. Identify and compare different ways of looking at an event, issue or problem. Identify how people or other living things might be affected by an event, issue, or problem. Identify possible options or responses; then make a choice or express an opinion. Begin to recognize music elements and simple music forms when presented orally. Uses appropriate music terminology in describing music. Begin to identify the sounds of a variety of instruments including orchestra and band instruments, instruments of various cultures, as well as children’s, male and female voices. Use appropriate music terminology in describing music. Describe ideas and feelings connected with listening to music performances. Identifies that there are a variety of purposes for creating and performing music. Describe ways that music reflects peoples’ experiences and cultures. Explore music from a variety of different cultures. Use experiences, imagination, essential elements and organizational principles to achieve the desired effect when creating, presenting and/or performing works of art. Explore aspects of the creative process and the effect of different choices on one's work. Create, present and/or perform a work of art that demonstrates an idea, mood or feeling. Describe how one’s own work reveals knowledge of the arts, orally and in writing.Recognize essential elements, organizational principles and aesthetic effects in works of art. Reflect and communicate about one's own art work verbally and in writing. Identify and describe personal preferences connected with viewing or listening to a work or art using terminology that conveys knowledge of the arts. Identify the disciplines used in an integrated work of art. Describe how the arts serve a variety of purposes in the student’s life, community and culture. Recognize how the arts can influence an individual’s life. Identify and perform a variety of developmental movement patterns (examples: throwing, kicking, catching). Practice exercises which develop strength, flexibility and cardiovascular endurance. Show enjoyment and participate in a variety of physical activities. Practice consistent behavior of good sportsmanship. Identify cooperative behavior (example: following directions). Practice specific rules for a variety of games and activities. Talk to the school about your child’s progress. Provide a variety of reading materials in the home and frequently take your child to the library. Promote school attendance and discourage absenteeism. Encourage your child to participate in learning activities when school is not in session. Keep in touch with your child’s teacher. Volunteer to participate in school activities. 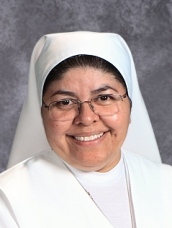 Sr. Ignacia Carrillo, FMA I am a Salesian Sister of St. John Bosco. I am thrilled to know that I will be part of your wonderful St. Francis school family this coming fall. I earned my Bachelor of Science degree from Angelo State University in my hometown of San Angelo, Texas in 1991. I earned my Master of Arts Degree in Catholic School Leadership from the University of San Francisco in 2008. I come from a large family of ten siblings! My parents believed in teaching us the importance of hard work and perseverance. I am grateful for the values of faith, service, and gratitude that my parents passed down to us in word and deed. I have wanted to be a teacher since I was five years old because I had some awesome teachers who inspired me and helped me believe that our goals could be accomplished if we set our minds to do so. I have been a consecrated religious for 23 fantastic years. My years of service have included teaching primary grades, as well as 13 years in administration. I have served many school families and children and feel blessed to work in a Catholic School setting. I believe that parents are the first educators of their children and we are called to support them in this awesome vocation in every way we can. I look forward to sharing our faith journey, having fun and making great memories! Please count on my prayers for you and your children.